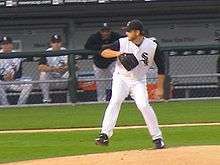 Mark Buehrle has made nine Opening Day starts for the Chicago White Sox, including in 2010. The Chicago White Sox are a Major League Baseball franchise based in Chicago. They play in the American League Central division. The White Sox have used 62 Opening Day starting pitchers since they were established as a Major League team in 1901. The first game of the new baseball season for a team is played on Opening Day, and being named the Opening Day starter is an honor, which is often given to the player who is expected to lead the pitching staff that season, though there are various strategic reasons why a team's best pitcher might not start on Opening Day. The White Sox have a record of 60 wins and 53 losses in their Opening Day games, through the 2013 season. The White Sox have played in three different home ball parks. They played at South Side Park from 1901 through the middle of 1910, the first Comiskey Park from 1910 through 1990, and have played at the second Comiskey Park, now known as U.S. Cellular Field, since 1991. They had a record of four wins and two losses in Opening Day games at South Side Park, 18 wins and 19 losses at the first Comiskey Park and four wins and one loss at U.S. Cellular Field, for a total home record in Opening Day games of 27 wins and 22 losses. Their record in Opening Day away games is 33 wins and 31 losses. Mark Buehrle holds the record for making the most Opening Day starts for the White Sox, with nine. Billy Pierce had seven Opening Day starts for the White Sox, Wilbur Wood had five, Tommy Thomas and Jack McDowell each had four, and Frank Smith, Jim Scott, Lefty Williams, Sad Sam Jones, Bill Dietrich, Gary Peters and Tommy John each had three. Several Baseball Hall of Famers have made Opening Day starts for the White Sox, including Ed Walsh, Red Faber, Ted Lyons, Early Wynn and Tom Seaver. The White Sox have played in the World Series five times. They won in 1906, 1917 and 2005, and lost in 1919 and 1959. 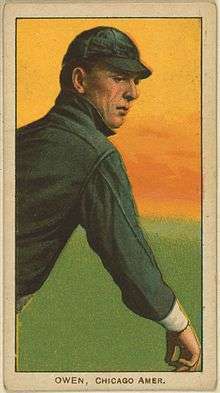 Frank Owen was the Opening Day starting pitcher in 1906, Williams in 1917 and 1919, Pierce in 1959 and Buehrle in 2005. The White Sox won all five Opening Day games in those seasons. In addition to being the White Sox' Opening Day starter in 1917 and 1919, Williams was also the Opening Day starter in 1920. However, he was suspended from the team later in the season and then banned from baseball for life for his role in throwing the 1919 World Series. Ed Cicotte, who had been the White Sox' 1918 Opening Day starter, was also banned from baseball as a result of his actions during the 1919 World Series. Ken Brett's Opening Day start on April 7, 1977 against the Toronto Blue Jays was the first game in Blue Jays' history. The Blue Jays won the game 9–5. Season Each year is linked to an article about that particular White Sox season. 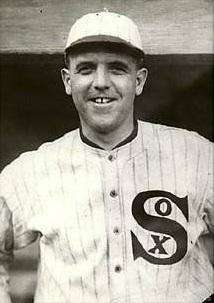 Hall of Famer Ed Walsh made two Opening Day starts for the White Sox. 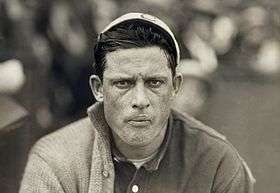 Frank Owen was the White Sox' Opening Day starter in 1906, the season they won their first World Series title. Ed Cicotte was the White Sox' Opening Day starting pitcher in 1918, and was later banned from baseball for his role in the Black Sox scandal. 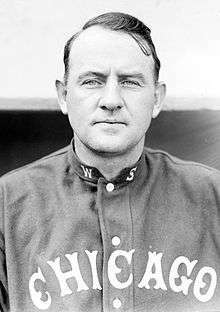 Nixey Callahan was the White Sox Opening Day starting pitcher in 1902. David Wells was the White Sox' Opening Day starter in 2001, his only season with the team. "Chicago White Sox Opening Day Starters and Results". Baseball-Reference.com. Retrieved April 12, 2009. "Chicago White Sox History & Encyclopedia". Baseball-Reference.com. Retrieved April 12, 2009. ↑ Bastian, Jordan (March 22, 2010). "Marcum tapped for Jays' Opening Day". MLB.com. Retrieved September 26, 2010. ↑ Dilbeck, Steve (February 24, 2014). "Dodgers may not start Clayton Kershaw in Sydney". Los Angeles Times. Retrieved February 25, 2014. 1 2 3 4 "Chicago White Sox Opening Day Starters and Results". Baseball-Reference.com. Retrieved May 3, 2009. 1 2 3 "Chi White Sox 4, Kansas City 2". Yahoo!. Retrieved April 12, 2009. 1 2 "Chi White Sox 6, Cleveland 0". Yahoo!. Retrieved April 6, 2010. ↑ "List of Hall of Famers" (PDF). National Baseball Hall of Fame and Museum. Retrieved September 20, 2010. ↑ "Chicago White Sox History & Encyclopedia". Baseball-Reference.com. Retrieved May 3, 2009. 1 2 "Opening Day 1906". Retrosheet. Retrieved May 3, 2009. 1 2 "Opening Day 1917". Retrosheet. Retrieved May 3, 2009. 1 2 "Opening Day 1919". Retrosheet. Retrieved May 3, 2009. 1 2 "Opening Day 1959". Baseball-Reference.com. Retrieved April 22, 2009. 1 2 "Opening Day 2005". Baseball-Reference.com. Retrieved April 12, 2009. 1 2 "Opening Day 1920". Retrosheet. Retrieved May 3, 2009. 1 2 Neft, Cohen (2000). The Sports Encyclopedia: Baseball. p. 124. ISBN 0-312-20437-X. ↑ Dunkle, J. "Claude Preston "Lefty" Williams". In Jones, D. Deadball Stars of the American League. Potomac Books. pp. 523–524. ISBN 978-1-57488-982-6. 1 2 "Opening Day 1918". Retrosheet. Retrieved May 3, 2009. 1 2 3 "Opening Day 1977". Baseball-Reference.com. Retrieved April 25, 2009. ↑ "Blue Jays Timeline". Major League Baseball. Retrieved May 3, 2009. ↑ "Opening Day 1901". Retrosheet. Retrieved May 3, 2009. ↑ "Opening Day 1902". Retrosheet. Retrieved May 3, 2009. ↑ "Opening Day 1903". Retrosheet. Retrieved May 3, 2009. ↑ "Opening Day 1904". Retrosheet. Retrieved May 3, 2009. ↑ "Opening Day 1905". Retrosheet. Retrieved May 3, 2009. ↑ "Opening Day 1907". Retrosheet. Retrieved May 3, 2009. ↑ "Opening Day 1908". Retrosheet. Retrieved May 3, 2009. ↑ "Opening Day 1909". Retrosheet. Retrieved May 3, 2009. ↑ "Opening Day 1910". Retrosheet. Retrieved May 3, 2009. ↑ "Opening Day 1911". Retrosheet. Retrieved May 3, 2009. ↑ "Opening Day 1912". Retrosheet. Retrieved May 3, 2009. ↑ "Opening Day 1913". Retrosheet. Retrieved May 3, 2009. ↑ "Opening Day 1914". Retrosheet. Retrieved May 3, 2009. ↑ "Opening Day 1915". Retrosheet. Retrieved May 3, 2009. ↑ "Opening Day 1916". Retrosheet. Retrieved May 3, 2009. ↑ "Opening Day 1921". Retrosheet. Retrieved May 3, 2009. ↑ "Opening Day 1922". Retrosheet. Retrieved May 3, 2009. ↑ "Opening Day 1923". Retrosheet. Retrieved May 3, 2009. ↑ "Opening Day 1924". Retrosheet. Retrieved May 3, 2009. ↑ "Opening Day 1925". Retrosheet. Retrieved May 3, 2009. ↑ "Opening Day 1926". Retrosheet. Retrieved May 3, 2009. ↑ "Opening Day 1927". Retrosheet. Retrieved May 3, 2009. ↑ "Opening Day 1928". Retrosheet. Retrieved May 3, 2009. ↑ "Opening Day 1929". Retrosheet. Retrieved May 3, 2009. ↑ "Opening Day 1930". Retrosheet. Retrieved May 3, 2009. ↑ "Opening Day 1931". Retrosheet. Retrieved May 3, 2009. ↑ "Opening Day 1932". Retrosheet. Retrieved May 2, 2009. ↑ "Opening Day 1933". Retrosheet. Retrieved May 2, 2009. ↑ "Opening Day 1934". Retrosheet. Retrieved May 2, 2009. ↑ "Opening Day 1935". Retrosheet. Retrieved May 2, 2009. ↑ "Opening Day 1936". Retrosheet. Retrieved May 2, 2009. ↑ "Opening Day 1937". Retrosheet. Retrieved May 2, 2009. ↑ "Opening Day 1938". Retrosheet. Retrieved May 2, 2009. ↑ "Opening Day 1939". Retrosheet. Retrieved April 30, 2009. ↑ "Opening Day 1940". Retrosheet. Retrieved April 30, 2009. ↑ "Opening Day 1941". Retrosheet. Retrieved April 30, 2009. ↑ "Opening Day 1942". Retrosheet. Retrieved April 30, 2009. ↑ "Opening Day 1943". Retrosheet. Retrieved April 30, 2009. ↑ "Opening Day 1944". Retrosheet. Retrieved April 27, 2009. ↑ "Opening Day 1945". Retrosheet. Retrieved April 27, 2009. ↑ "Opening Day 1946". Retrosheet. Retrieved April 27, 2009. ↑ "Opening Day 1947". Retrosheet. Retrieved April 27, 2009. ↑ "Opening Day 1948". Retrosheet. Retrieved April 27, 2009. ↑ "Opening Day 1949". Retrosheet. Retrieved April 27, 2009. ↑ "Opening Day 1950". Retrosheet. Retrieved April 27, 2009. ↑ "Opening Day 1951". Retrosheet. Retrieved April 27, 2009. ↑ "Opening Day 1952". Retrosheet. Retrieved April 27, 2009. ↑ "Opening Day 1953". Retrosheet. Retrieved April 27, 2009. ↑ "Opening Day 1954". Baseball-Reference.com. Retrieved April 27, 2009. ↑ "Opening Day 1955". Baseball-Reference.com. Retrieved April 27, 2009. ↑ "Opening Day 1956". Baseball-Reference.com. Retrieved April 27, 2009. ↑ "Opening Day 1957". Baseball-Reference.com. Retrieved April 27, 2009. ↑ "Opening Day 1958". Baseball-Reference.com. Retrieved April 27, 2009. ↑ "Opening Day 1960". Baseball-Reference.com. Retrieved April 27, 2009. ↑ "Opening Day 1961". Baseball-Reference.com. Retrieved April 27, 2009. ↑ "Opening Day 1962". Baseball-Reference.com. Retrieved April 27, 2009. ↑ "Opening Day 1963". Baseball-Reference.com. Retrieved April 27, 2009. ↑ "Opening Day 1964". Baseball-Reference.com. Retrieved April 26, 2009. ↑ "Opening Day 1965". Baseball-Reference.com. Retrieved April 26, 2009. ↑ "Opening Day 1966". Baseball-Reference.com. Retrieved April 26, 2009. ↑ "Opening Day 1967". Baseball-Reference.com. Retrieved April 26, 2009. ↑ "Opening Day 1968". Baseball-Reference.com. Retrieved April 26, 2009. ↑ "Opening Day 1969". Baseball-Reference.com. Retrieved April 26, 2009. ↑ "Opening Day 1970". Baseball-Reference.com. Retrieved April 26, 2009. ↑ "Opening Day 1971". Baseball-Reference.com. Retrieved April 26, 2009. ↑ "Opening Day 1972". Baseball-Reference.com. Retrieved April 26, 2009. ↑ "Opening Day 1973". Baseball-Reference.com. Retrieved April 26, 2009. ↑ "Opening Day 1974". Baseball-Reference.com. Retrieved April 26, 2009. ↑ "Opening Day 1975". Baseball-Reference.com. Retrieved April 26, 2009. ↑ "Opening Day 1976". Baseball-Reference.com. Retrieved April 26, 2009. ↑ "Opening Day 1978". Baseball-Reference.com. Retrieved April 25, 2009. ↑ "Opening Day 1979". Baseball-Reference.com. Retrieved April 25, 2009. ↑ "Opening Day 1980". Baseball-Reference.com. Retrieved April 25, 2009. ↑ "Opening Day 1981". Baseball-Reference.com. Retrieved April 25, 2009. ↑ "Opening Day 1982". Baseball-Reference.com. Retrieved April 22, 2009. ↑ "Opening Day 1983". Baseball-Reference.com. Retrieved April 22, 2009. ↑ "Opening Day 1984". Baseball-Reference.com. Retrieved April 22, 2009. ↑ "Opening Day 1985". Baseball-Reference.com. Retrieved April 20, 2009. ↑ "Opening Day 1986". Baseball-Reference.com. Retrieved April 20, 2009. ↑ "Opening Day 1987". Baseball-Reference.com. Retrieved April 20, 2009. ↑ "Opening Day 1988". Baseball-Reference.com. Retrieved April 20, 2009. ↑ "Opening Day 1989". Baseball-Reference.com. Retrieved April 18, 2009. ↑ "Opening Day 1990". Baseball-Reference.com. Retrieved April 18, 2009. ↑ "Opening Day 1991". Baseball-Reference.com. Retrieved April 18, 2009. ↑ "Opening Day 1992". Baseball-Reference.com. Retrieved April 18, 2009. ↑ "Opening Day 1993". Baseball-Reference.com. Retrieved April 18, 2009. ↑ "Opening Day 1994". Baseball-Reference.com. Retrieved April 18, 2009. ↑ "Opening Day 1995". Baseball-Reference.com. Retrieved April 18, 2009. ↑ "Opening Day 1996". Baseball-Reference.com. Retrieved April 14, 2009. ↑ "Opening Day 1997". Baseball-Reference.com. Retrieved April 14, 2009. ↑ "Opening Day 1998". Baseball-Reference.com. Retrieved April 14, 2009. ↑ "Opening Day 1999". Baseball-Reference.com. Retrieved April 14, 2009. ↑ "Opening Day 2000". Baseball-Reference.com. Retrieved April 14, 2009. ↑ "Opening Day 2001". Baseball-Reference.com. Retrieved April 14, 2009. ↑ "Opening Day 2002". Baseball-Reference.com. Retrieved April 14, 2009. ↑ "Opening Day 2003". Baseball-Reference.com. Retrieved April 14, 2009. ↑ "Opening Day 2004". Baseball-Reference.com. Retrieved April 14, 2009. ↑ "Opening Day 2006". Baseball-Reference.com. Retrieved April 12, 2009. ↑ "Opening Day 2007". Baseball-Reference.com. Retrieved April 12, 2009. ↑ "Opening Day 2008". Baseball-Reference.com. Retrieved April 11, 2009. ↑ "Chi White Sox 15, Cleveland 10". Yahoo!. Retrieved April 2, 2011. ↑ "Opening Day 2012". Baseball-Reference.com. Retrieved April 7, 2012.